Box with inlay and raised lacquer. 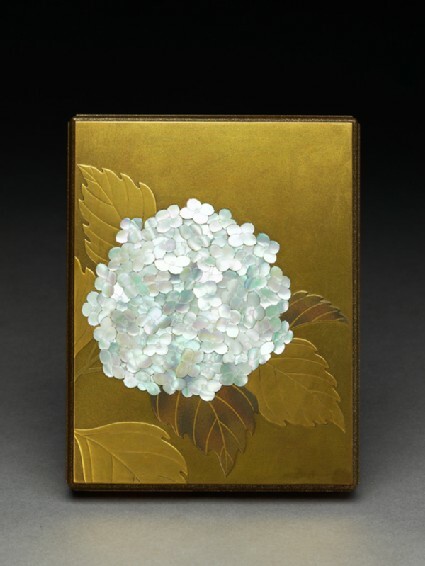 A hydrangea inlaid in pearl shell, with the leaves in raised and polished lacquer. Nashiji corners and interior. Rectangular box with a design on the lid and sides of hydrangea leaves in raised lacquer (takamaki-e), the flower in high relief pearl shell. The canted corners of nashiji and the interior and base of densely sprinkled gold flakes (nashiji). Crusted inlay of pearl-shell or other materials is an old Japanese technique, originally derived from Chinese models that were imported as early as the 6th century. But as with almost all 'borrowed' techniques, the Japanese developed their own way of doing things, by selection and rejection, until the results may far surpass the original models. The use of several techniques upon one object is almost a commonplace in Japanese work of the finest quality. Bought by the Ingrams in Yokohama in June 1908 for 55 yen; quite a high price.